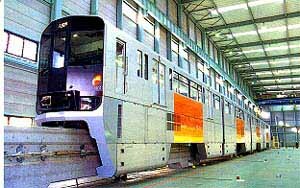 Yet another giant Alweg-type system has been built by Hitachi. This one is west of Tokyo. Pictured here is one of the four-car trains that run on the first segment. The Tama Monorail will one day include an amazing 93 km of dual-beamed guideway. Unlike monorail "plans" seen in other parts of the world, the Japanese usually follow through and build them. As with most monorails in Japan, an integral part of the system will be many intermodal connections with different rail lines. The corridor is an interesting one, with rivers to cross, major roads to follow, grades to climb and descend, as well as one segment where the guideway dips below grade. Additional pictures and maps are now available in the Special Tama Page.